Commander 7x50c is rated 4.7 out of 5 by 35. Rated 5 out of 5 by Chuck58 from Superlative binoculars for terrestrial use too! I obtained my first set back in 2007. I make extensive use of the compass and reticle. After years of "pampered" but moderate outdoor use I sent it in for refurbishing. While there for several week I contacted Philip in customer service asking a status on them as I was going to Africa in the near future. Philip mentioned there was an issue with the compass and they were awaiting parts and offered a brand spanking new-in-the-box replacement set. I accepted and they arrived in time for my trip to Africa. How can anyone beat that Customer Service??? Rated 5 out of 5 by Admiral Karrlo from I bought my steiner military/marine 7X50 back in the early 80's. They went with me on many expeditions and I loved them especially the lighted compass. Last year the light quit working and the compass had developed a small bubble that caused it to hang a little. I started looking for some new steiners, but ran into some information on the service department. I called a very pleasant man on the telephone and he told me to send them back and they would check them out for me. Was I surprised about 2 weeks later when a box arrived from steiner and when I opened it up, I found a brand new beautiful 7X50 with lighted compass and several extras. THEY ARE WONDERFUL! THANK YOU! THANK YOU! Rated 5 out of 5 by crossbowme from You Have To Hear this One! In October 1981, I came into a little money and was determined to buy a Steiner which I had seen the German military used. I bought one and used it whenever sailing, hunting, etc. It lasted thru four sailboats, two wives, three kids and twenty seven years in the Army and thru combat zones. Last fall, I noticed the vision was clouded and the compass was shot. Fearing a huge bill, I sent it into Steiner. They quickly replied saying they would repair it or replace it under their "Heritage" program. After a couple of days, they sent me an email saying they repaired it (replaced the compass also) and it was on it's way back to me at no cost. In all my seventy years, I have never seen customer service such as this! If you're only thinking about buying a Steiner make the plunge and get the best. You can't beat this company. Rated 5 out of 5 by Baysailor from Outstanding product and remarkable warranty My recent acquisition of my new Steiner Commanders was a replacement under the warranty of my original purchase in about 2003. Your amazing warranty replaced them and I took them on a 2 week cruise on the Chesapeake. They were just as I expected--every bit ask good as my original pair. I had ample opportunity to test them including help a friend locate an errant dinghy in a 3' chop. We immediately spied them from about 1.5 miles with no difficulty. The clarity and sharpness is as remarkable as you have always heard about Steiners. Great product and a great warranty. Rated 5 out of 5 by Pete01 from Simply the Best I am a professional mariner on an ocean going container ship. We use Steiner Binoculars almost exclusively as part of our bridge equipment. I purchased the 7X50 Commander-C for my personal use based on the positive experience that I have had with your product in my professional career. Rated 5 out of 5 by Nick58 from High Quality-Good Service I had purchased an older Commander 7X50c quite a few years ago. They were excellent binoculars and lasted for many years in the harsh Florida salt water marine environment. As a professional boat captain, I can tell you this particular model performed exactly as expected. When I finally had a warranty issue, Steiner customer service explained the warranty procedure fully and promptly sent me a replacement set. I'll be a customer for life because of the high quality of this product and the great customer service. 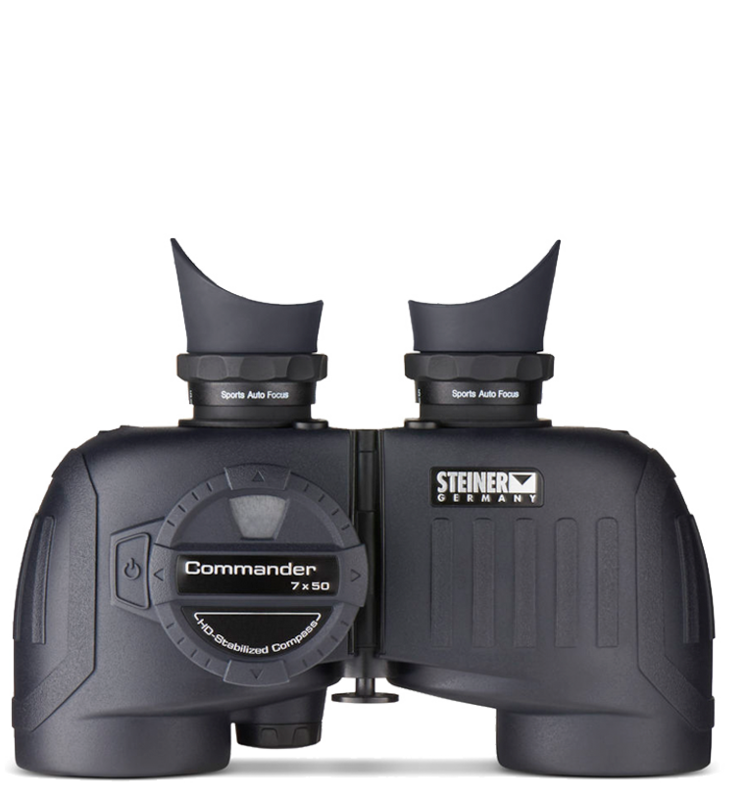 Rated 5 out of 5 by Darlene from Great product; quality company I purchased Steiner Commander binoculars at a boat show about 25 years ago. I recently sent them to Steiner for what I thought would be a simple adjustment. I was very surprised to receive back in the mail a brand new set of binoculars. I could not be more pleased with the company or their product and the replacement warranty. What is the difference between Commander Global C 7x50 and Commander 7x50c other then former being twice as costly as the latter. The Globals are our top of the line optic with HD Diamond coatings and worldwide digital compass as the primary differences. The Commander 7x50c has a compass zone specific compass that will not function properly outside of the compass zone it is calibrated for. The Global compass will work in all compass zones. Do these binoculars have a built in stabilizer so that you can see an object clearly and still even if your are moving? Hello, We do not offer any electronic image stabilizing binoculars. Hi. I have steiner marine 7x50C. Excellent binos. I have cracked the plastic holder that holds eyepiece onto the lens though and it no longer stay on. Where can I buy replacement eyepiece or should I send to steiner for repair? Tx! Steiner-Optics.com/repairs Please create a customer support case for instructions to return your binoculars. Steiner-optics.com/repairs Please create a support case on our customer service portal, we'll be glad to service your binoculars under the Heritage Warranty. I own a Commander III with an analog compass. (15 years old). Still works great but compass is off. Is there an adjustment screw on them? I can't find it. A PDF user's manual?? I used a pair of these on my last charter. Are they sold with attached lens caps, or must they be purchased separately? They will come with eyepiece and objective covers.